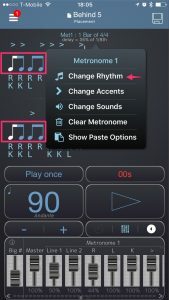 To add a rhythm to Metronome 1 or Metronome 2 you need to go to the Change Rhythm page. 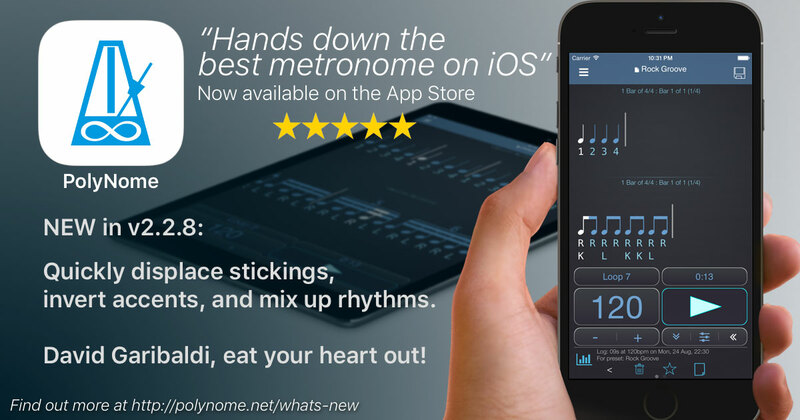 The Change Rhythm page is where you enter the rhythm you want PolyNome to play. TIP: Another way of playing a rhythm is to enter a bar of 16th notes and assign sounds to just some of those notes. This is sometimes a quicker way to work and provides more flexibility. a) The rhythm you’ve entered. 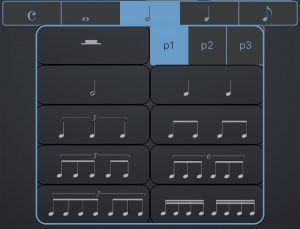 You can swipe left/right in here to select different parts of the rhythm in order to enter or delete notes in the middle of the rhythm. b) The time signature, number of bars filled and 16th notes remaining in the bar. Tap the time signature to change it. c) Note type selector. Changing this affects the note options you see in section f). C stands for Common rhythms. There are 3 pages of these which you can use to enter most rhythmic ideas. d) Use these buttons to delete parts of the rhythm you’ve entered. e) Page selector. There are up to 3 pages of notes available (in section f) for each option. f) Note entry buttons. Tap a button to add the note group to your rhythm. g) Tap the Muting Off button to choose a Random Mute type. You can have PolyNome randomly mute notes, note groups (eg. a group of quintuplets), bars, or cycles. When muting is on you’ll see a slider where you can set the probability that random muting will occur. The image below shows page 3 of the common rhythms. 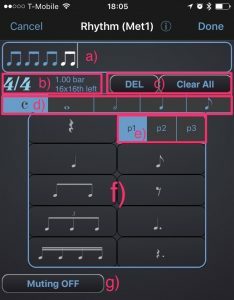 Tapping these buttons will add the component individual notes required to create the rhythm shown. Note that the rhythm may look different in the display eg. 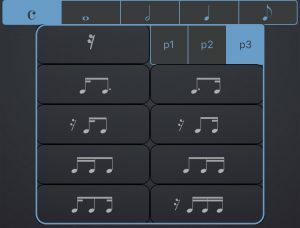 the bottom right button will enter a single 16th rest and 3 individual 16th notes. Tapping the whole note, half note, quarter note or eighth note options will give you divisions of those notes in section f). The image below shows page 1 of the divisions of a half note. Use these options for quickly creating polyrhythms of anything up to 1 – 24 vs 1 – 24. Had this ages, but had no time to learn how to use it. Am out in the road now so used the time to check out the options and it’s amazing! Thanks Gary! Glad you like it. Hi, I can’t find dotted half notes or ties anywhere? Could someone help if possible? Thanks! There are no dotted half notes or ties in PolyNome. The lack of dotted half notes is due to a lack of space in the palettes of options. The lack of ties is a technical issue. 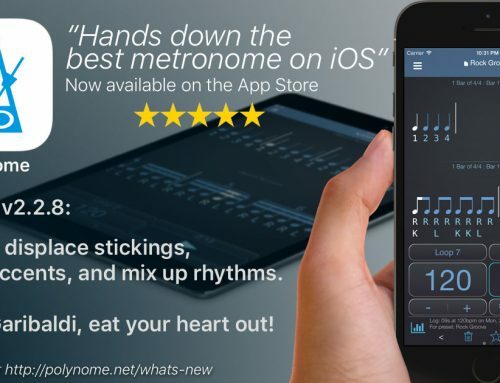 PolyNome wasn’t conceived as a notation app and so it has limited functionality on that front. You can represent a dotted half with a half and a quarter rest. Here’s how you can simulate ties.